Saudi 2013 budget sees revenues over $220 billion. RIYADH, Saudi Arabia (AP) — Saudi Arabia’s official news agency says King Abdullah’s cabinet has approved the kingdom’s largest ever annual budget, projecting revenues of 829 billion rials, or $221 billion, for 2013 and 820 billion rials, or $219 billion of expenditure. The budget foresees a $2.4 billion surplus. The Cabinet meeting Saturday reported that revenues in 2012 amounted to $330 billion with $227 billion expenditure, leaving a $103 billion surplus. That surplus was due to the government’s calculating oil prices at $70 per barrel, while the actual price stood at around $100 per barrel. The 2013 allocation for education has risen by 21 percent to $54.3 billion. The budget includes $26.6 billion for health and social affairs services and $9 billion for municipality services. 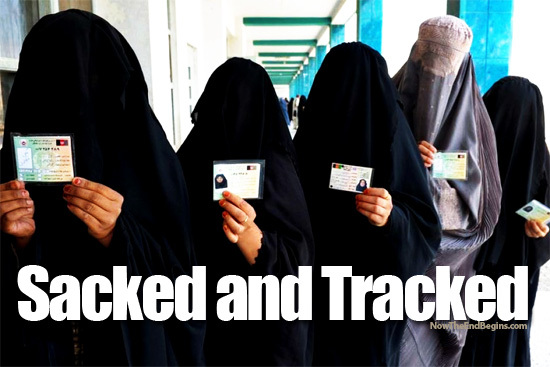 Saudi Women Tracked With RFID Chips By Their Male Masters. But the ruling, which was to take effect this month, has not been implemented. source- France 24. RIOTS! 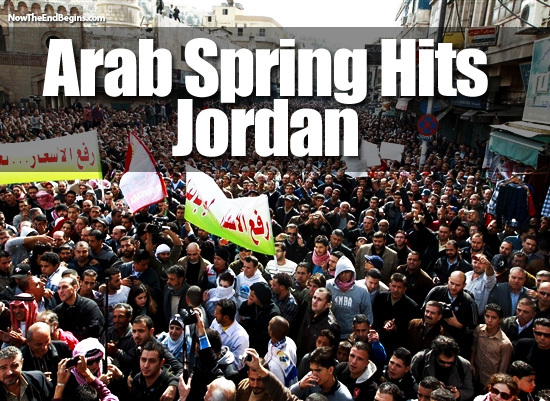 The Muslim Brotherhood’s Arab Spring Riots Finally Arrive In Jordan. RELATED STORY: Please visit our Muslim Brotherhood and Obama Archives. A guaranteed eye-opener! From NBC WorldNews: Thousands of people called for the removal Jordan’s King Abdullah at a rally in downtown Amman on Friday in protest at fuel price hikes, in a marked escalation of street anger in the third day of demonstrations in the Western-backed kingdom. “Go down Abdullah, go down,” the protesters Friday chanted as police, some in riot gear, largely stayed away from crowd, near the main Husseini Mosque. The crowed also chanted “The people want the downfall of the regime,” the rallying cry of the Arab Spring uprisings that have shaken the Middle East and toppled leaders in Tunisia, Egypt, Libya andYemen. “Shame. Shame. Prices are spiking and Abdullah gambles,” people shouted. Criticizing the king in public is forbidden in Jordan and is punishable by up to three years in jail. The Muslim Brotherhood, the country’s largest opposition group, had called on people to take to the streets, but top officials from the group choose not to participate in the rally. The 50-year-old king has ruled since 1999. On Thursday, the protester was killed and scores were injured during an attack on a police station overnight in Jordan’s second-largest city of Irbid, witnesses told Reuters. Police said they used tear gas to disperse masked youths who attacked government property. Some protesters torched part of Irbid’s municipal headquarters later on Thursday to vent their anger at officials who said the dead young man had been armed, the witnesses said. Elswhere, hundreds of people blocked roads, set government buildings alight and trashed shops in the towns of Maan, Tafila, Salt and Karak. “The country has risen up from north to south and this state of popular tension is unprecedented,” said Murad Adailah, a senior member of the Islamic Action Front, the political arm of the Muslim Brotherhood. A staunch U.S. ally with the longest border with Israel, Jordan has not seen the kind of mass revolts that swept other Arab countries. The coming days will be crucial in testing whether the relative calm can continue. Jordanians have held occasional protests inspired by the Arab Spring uprisings, demanding democratic reforms and curbs on corruption. But those gatherings were peaceful and the security forces did not use weapons. Demonstrators sometimes chant against Abdullah but there seems to be little enthusiasm for revolution. The monarchy is seen as a guarantor of stability, balancing the interests of tribes native to the east of the Jordan river with those of the majority of citizens, who are of Palestinian origin. But the price rises announced on Tuesday could boost the popularity of the Islamist opposition, emboldened by the successes of its ideological brethren in Egypt and Tunisia. The government has warned Islamists not to take advantage of the tension caused by the price rises but they have never sounded more confident. “This is a huge political crisis and it has become clear that there is no more room to delay real and comprehensive reforms,” said Jamil Abu Bakr, a Muslim Brotherhood leader. Jordan’s Islamists to march, angry at slow reform. AMMAN (Reuters) – Jordan‘s main Islamist opposition is preparing to flex its muscles in a march on Friday that could be its biggest demonstration since Arab Spring-inspired protests last year against the slow pace of political reform. Jordan has had nearly two years of peaceful street protests by Islamists, tribal figures and leftists, inspired by the Arab Spring uprisings, but they have focused on reforming government and limitingKing Abdullah’s powers rather than ousting him.